On March 8, 2004 I was awarded my Doctor of Philosophy from the University of South Australia. I started my PhD in 1999 and submitted my draft thesis for examination in June 2003, which was passed and the final version was submitted in February 2004. 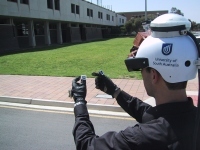 My PhD thesis is titled Interactive 3D Modelling in Outdoor Augmented Reality Worlds, and was performed at the Wearable Computer Lab, School of Computer and Information Science, at the University of South Australia. I invite you to read a copy of my thesis, which is available from this web page. I look forward to reading any comments you may have on my work, and hope you enjoy reading it. This dissertation presents interaction techniques for 3D modelling of large structures in outdoor augmented reality environments. Augmented reality is the process of registering projected computer-generated images over a user's view of the physical world. With the use of a mobile computer, augmented reality can also be experienced in an outdoor environment. Working in a mobile outdoor environment introduces new challenges not previously encountered indoors, requiring the development of new user interfaces to interact with the computer. Current AR systems only support limited interactions and so the complexity of applications that can be developed is also limited. This dissertation describes a number of novel contributions that improve the state of the art in augmented reality technology. Firstly, the augmented reality working planes technique gives the user the ability to create and edit objects at large distances using line of sight and projection techniques. This technique overcomes limitations in a human's ability to perceive depth, and requires simple input devices that are available on mobile computers. A number of techniques that leverage AR working planes are developed, collectively termed construction at a distance: street furniture, bread crumbs, infinite planes, projection carving, projection colouring, surface of revolution, and texture map capture. These techniques can be used to create and capture the geometry of outdoor shapes using a mobile AR system with real-time verification and iterative refinement. To provide an interface for these techniques, a novel AR user interface with cursors and menus was developed. 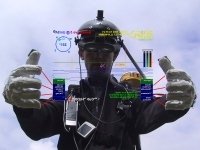 This user interface is based around a pair of pinch gloves for command input, and the use of a custom developed vision tracking system for use in a mobile environment. To develop applications implementing these contributions, a new software architecture was designed to provide a suitable abstraction to make development easier. This architecture is based on an object-oriented data flow approach, uses a special file system notation object repository, and supports distributed objects. The software requires a platform to execute on, and so a custom wearable hardware platform was developed. The hardware is based around a backpack that contains all the equipment required, and uses a novel flexible design that supports simple reconfiguration. Based on these contributions, a number of modelling applications were developed to demonstrate the usefulness of these techniques. These modelling applications allow users to walk around freely outside, and use proprioception and interactions with the hands to control the task. Construction at a distance allows the user to model objects such as buildings, trees, automobiles, and ground features with minimal effort in real-time, and at any scale and distance beyond the user's reach. 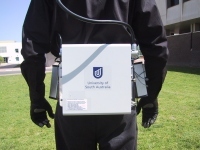 These applications have been demonstrated in the field to verify that the techniques can perform as claimed in the dissertation. My PhD thesis is titled Interactive 3D Modelling in Outdoor Augmented Reality Worlds and is available for download from this page. I have prepared a PDF file of the entire document which you can print, as well as a HTML version which is browsable on the web. I have also produced separate chapters so that you can download only the parts you need if bandwidth is limited. You may share the complete thesis document with others, but please do not distribute the separate chapter files because they do not contain title information.